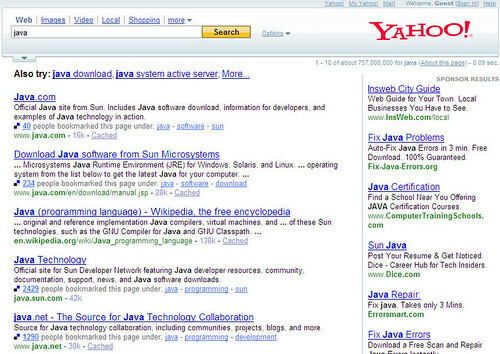 TechCrunch got a tip that Yahoo Search is testing integration Del.icio.us results in the search results. In my opinion, bad idea Yahoo. Michael Arrington says it "Delicious search is one of the best ways of searching for things when a standard search doesn’t pull up what you are looking for." True, but Yahoo search users won't understand it. They simply won't get it. We have discussion on this topic at Sphinn where SEOs and SEMs weigh in. One person said this will lead to more Delicious spam, "so begins the mass creation of Delicious accounts meant to spam." Of course, for bloggers and delicious users, we are happy, as one person said, "What a great step that would be, given word of mouth is a bigger influencer of our purchase behaviour than is any other variable." But as Michael said, "excellent idea, horrible integration, stumbleupon nailed it on the head, the delicious integration is is inferior hopefully they will bring it up." Still, I don't think Yahoo searchers would get it. I don't even think most Google searchers would get it. It should work for you on a search for JAVA, but it doesn't work for me in Safari. Previous story: Do Links Get Old & Expire As They Get Older?